Flameshadow Conjuring And flip cards. Kogarashi on Does this combo work? Let's see if I've got your initial plan right. Assuming Thousand-Year Elixir is on the battlefield, allowing you to activate creature abilities the turn they ETB. Activate Selvala, Heart of the Wilds for some number of mana equal to the greatest power you have on the board (if with Muldrotha, that'd be 6). Or use Krosan Restorer to untap 1 or 3 lands (depending on if you have threshold), where at least one of those lands taps for more than 1 mana. 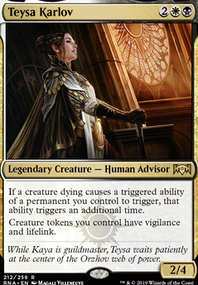 Activate Ashnod's Altar , sacrificing Selvala or Restorer. Gain , trigger Liliana, Heretical Healer Flip to flip. Activate Liliana, Defiant Necromancer 's -X ability, targeting your newly-dead mana creature. Here's the first hangup. The -X ability says "nonlegendary creature card," and Selvala is legendary, so she can't work in this interaction. So it has to be Restorer. 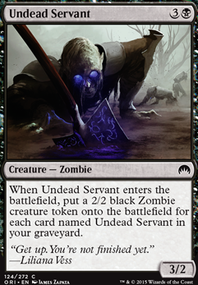 This activation puts Liliana in the graveyard due to lack of loyalty. 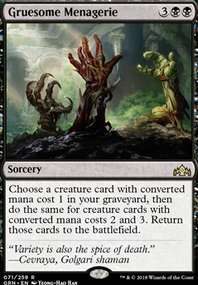 You didn't mention it, but presumably you activate Krosan Restorer again for mana, then sacrifice it to Ashnod's Altar for 2 more. I'm ignoring Selvala now because Liliana can't get her back. 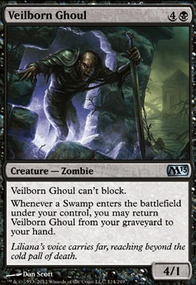 Cast Animate Dead or Necromancy on a clone creature and have it copy Muldrotha, the Gravetide , forcing you to sacrifice one due to the legend rule. You keep the clone and send the original Muldrotha to the graveyard. 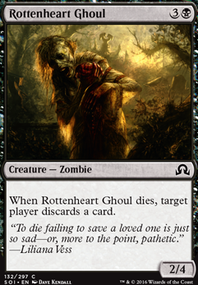 Using Muldrotha, the Gravetide 's ability, you cast Liliana, Heretical Healer Flip from the graveyard. 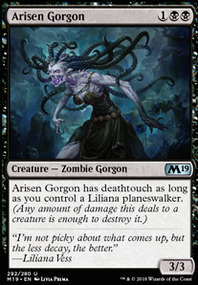 Then you cast a second Animate Dead or Necromancy (because the first is still enchanting your Muldrotha clone), getting the original Muldrotha back from the graveyard, triggering the legend rule again, which flips Liliana again. You keep the original Muldrotha to "reset" the "one permanent of each type" restriction. 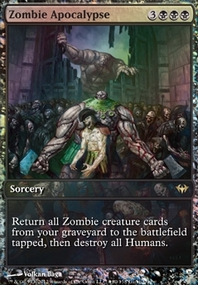 You -X Liliana to get Restorer back, putting Liliana back in the graveyard. Go to step 4, alternating Muldrotha and clone as necessary. 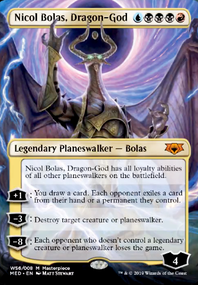 In order for this to work, you can't use Selvala, Heart of the Wilds because it's legendary and Liliana, Defiant Necromancer specifically targets nonlegendary creature cards. 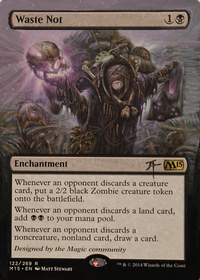 For Krosan Restorer to be a good fit, you'll probably want to be at threshold (to hit three lands instead of one), and you'll want those lands to produce lots of mana, like the Gaea's Cradle and Itlimoc, Cradle of the Sun you mentioned later, with enough creatures to make it functional. 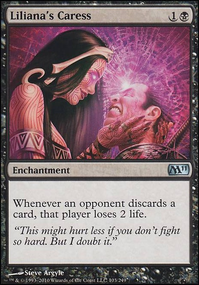 With so many moving parts, it runs the risk of being extremely easy to disrupt if your opponents have answers, but as far as I can see it functions aside from Selvala being a bad fit, assuming your lands are producing enough mana (and it should be mentioned that the aforementioned choice lands only produce green mana; you're going to need lots of black as well because Liliana and Animate/Necromancy is going to be alone, with a fourth if you have to cast both enchantments before you can get mana on the loop again. Raging_Squiggle on Does this combo work? Missed the threshold part of Krosan Restorer . Assuming it’s active throughout, your generate an initial , and repeating everything I said about, you’d have to pay a total of ( Animate Dead , Necromancy , Liliana, Heretical Healer Flip), resulting in still a deficit of mana. oliveoilonyaasscureshemorrhoid on Does this combo work? How it works: Activate Selvala/Restorer's mana ability with the help of Greaves/Elixir, activate Altar targeting Selvala/Restorer (which causes Liliana to flip), activate Liliana targeting Selvala/Restorer, cast Animate/Necromancy targeting Impersonator/Metamorph (targeting Muldrotha, then keep the cloned Muldrotha), cast Liliana with Muldrotha, cast Animate/Necromancy with Muldrotha (targeting Muldrotha, keeping the real Muldrotha), repeat. 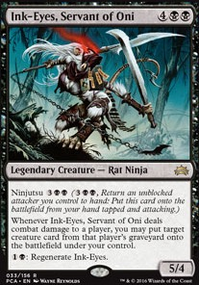 I would probably pick Liliana, Heretical Healer Flip and Jace, Vryn's Prodigy Flip for the first two.. for the third i'm a bit in trouble since i don't actually think there aren't legendary esper creatures involved in the story.. Not even dimir using Sorin Markov so it would be complicated ahahah.. this one could be good for an esper deck in modern and not in edh..
Placed some updates to the deck. Switched out Vampire Sovereign for Lord of the Accursed . Alos removed one Sovereign's Bite . I plane to remove all of the rest pf the Sovereign's Bite for Gray Merchant of Asphodel . 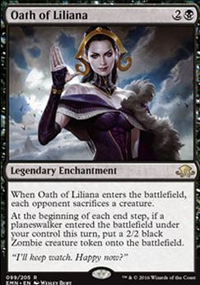 It may hurt my deck but i have to have my lady love Liliana in the deck. 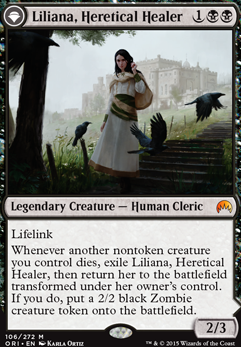 I will replace Liliana, Untouched By Death with Liliana, Heretical Healer Flip. 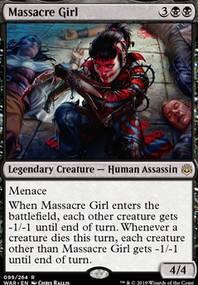 I feel there is better synergy and i can still get the famous removal Liliana of the Veil is loved for, But the second ability of this one is better for a creature based beck like this. The ultimate is also amazing if one can manage to get it off. 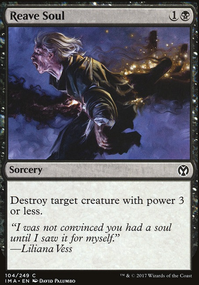 Looking to replace Dark Salvation i love it but i feel something like Duress , Despise , or Thoughtseize . 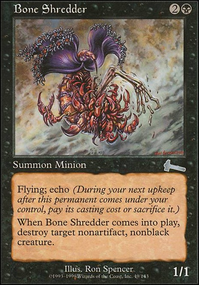 Though i think it is good i have played a few rounds with friends and feel it is more a sideboard card as i was always playing a creature instead of Dark Salvation , or i would play something cheaper like Go for the Throat to cast other cards in my hand. I enjoyed Shirei but wanted to test others. Athreos was...slightly annoying. Once my friends learned the trick he lost a lot of impact. Might revisit him in the future though.